Hurricane Spin Broom® | Official Site | Just One Pass Picks Up Any Mess With Ease! Cordless, Lightweight Spinning Broom That Works On Every Hard Floor! Hurricane Spin Broom™ cleans messes quickly and easily. Don't touch your mess thanks to the one-touch bin that empties in seconds. Using an ordinary broom and dust pan doesn't always pick up your mess. From the makers of the best selling Hurricane Spin Mop™, comes the Hurricane Spin Broom®! It's the lightweight, cordless spinning broom that picks up every mess with ease. READ FULL DESCRIPTION The secret is in the Spin Broom's triple brush technology that rotates the brush bristles like a street sweeper. This triple brush technology uses centrifugal force combined with rotating action so it eats everything in its path. Hurricane Spin Broom® reaches under baseboards and cleans dry and wet messes. Pick up dirt, cereal, chips, pet hair, and more! The one-touch bin has a large capacity and empties in seconds. There's no touching the mess that you've picked up. You'll never need batteries, bags, or cords when you use Hurricane Spin Broom®. Its so lightweight and weighs less than 2 pounds. Hurricane Spin Broom® works great on wood, laminate, and tile surfaces. Get your Hurricane Spin Broom® today for just $19.99 and $9.99 shipping and handling! Plus, if you order now, you can double your order and receive a second Hurricane Spin Broom® as well as the amazing Hurricane™ Fur Wizard™! It's a self cleaning, reusable lint brush! Just pay a separate fee of $9.99. Start sweeping effortless with Hurricane Spin Broom® and place your orders now! Bristles Reach Outside The Sweeper To Get In Cracks And Crevices For A Complete Clean! Triple Brush Technology Rotates With Cyclonic Action, Pulling In Everything In Its Path! Large Capacity Dust Pan Is Built In And Empties With A Press Of A Button. 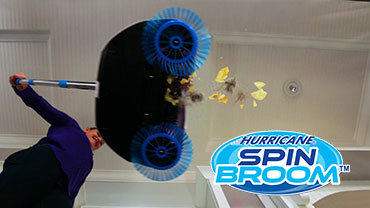 Hurricane Spin Broom™ Picks Up Food, Pet Hair, Dust, Even Broken Glass!